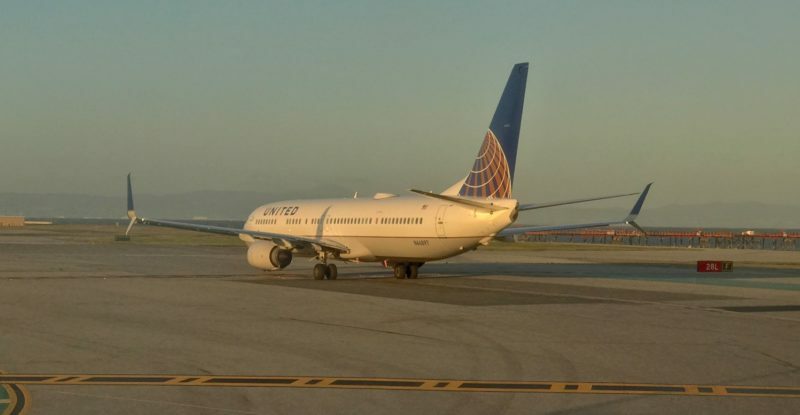 But a recent pair of United flights between San Francisco and Seattle (blocked at two hours with a real flight time of about 90 minutes) highlighted what really felt like a lack of decent service design, more than any issue with the crew in the air or on the ground. Yes, all three of these issues are certainly first class problems, and I’m also using United as a proxy for the three large US carriers, because these days they’re mostly indistinguishable in their mediocrity, despite attempts to swap free upgrades for paid tickets in first class. But if United and the other carriers want premium dollars, they need to create a premium product. 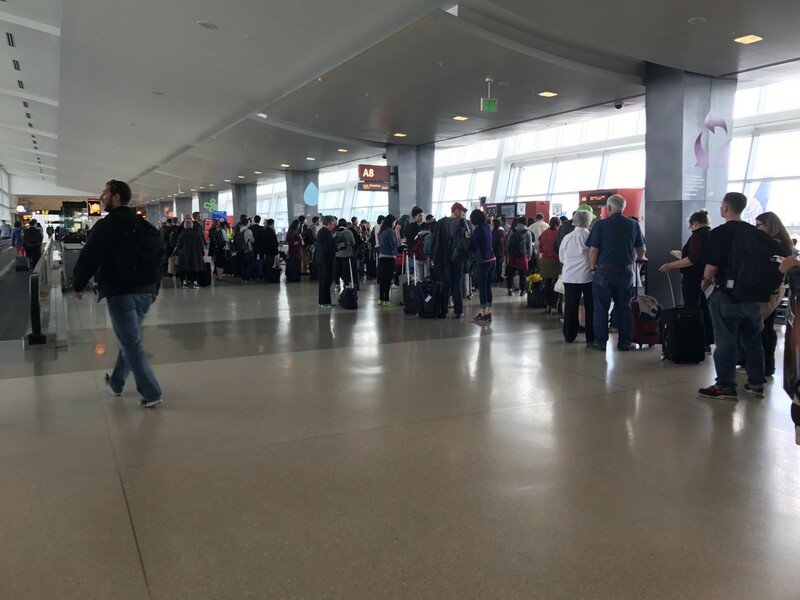 At both San Francisco and Seattle, boarding was shockingly disorganised, even with the addition in SFO of the multiple boarding group lines, which helped slightly by getting passengers out of the main walkway area, but still involved first class travellers getting stuck 20-deep in the premium queue. At SeaTac, somehow the staff working the desk had no idea that their ongoing announcements requesting passengers to gatecheck their luggage were only audible in the higher-ceilinged space where no passengers were lining up. Yes, it’s important to reward elite passengers sitting in economy for their loyalty by permitting them to board early. 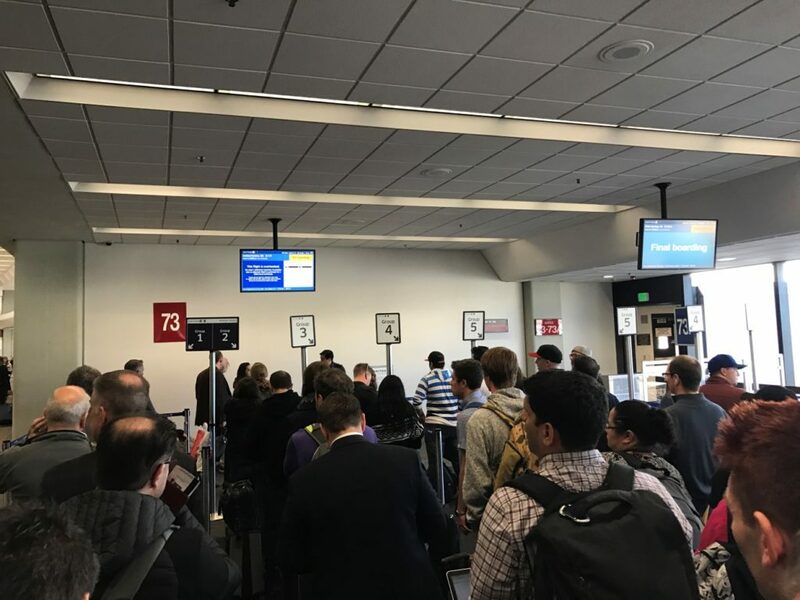 But it strikes me that the boarding process needs to be redesigned so paying first class passengers should at least be able to avoid standing in a queue for 45 minutes if they want a hope in hell of stowing their bag anywhere nearby their seat — or on the plane at all. Given the US carriers’ inconsistent service levels, I should perhaps feel grateful that pre-departure beverages were served on both of my flights. 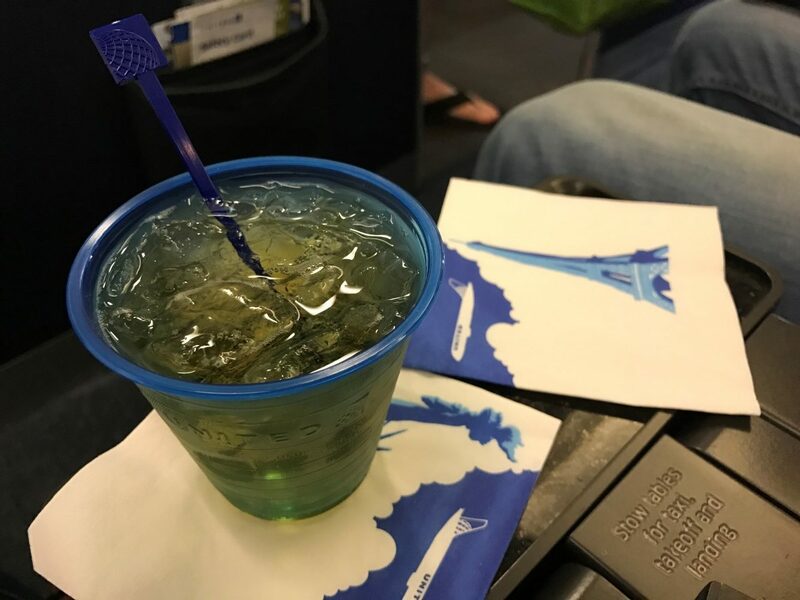 I enjoy a drink or two, but the overpowering strength of the drinks I was served throughout was deeply unwise given the industry’s recent focus on passengers disrupting flights, often owing to inebriation. Mini plastic cups don’t feel premium either, and when filled with ice and a full mini of liquor it seemed like only the barest waft of mixer had been anywhere near the drink, as if someone had opened the ginger ale, waved it in the general direction of the cup and then served the drink. 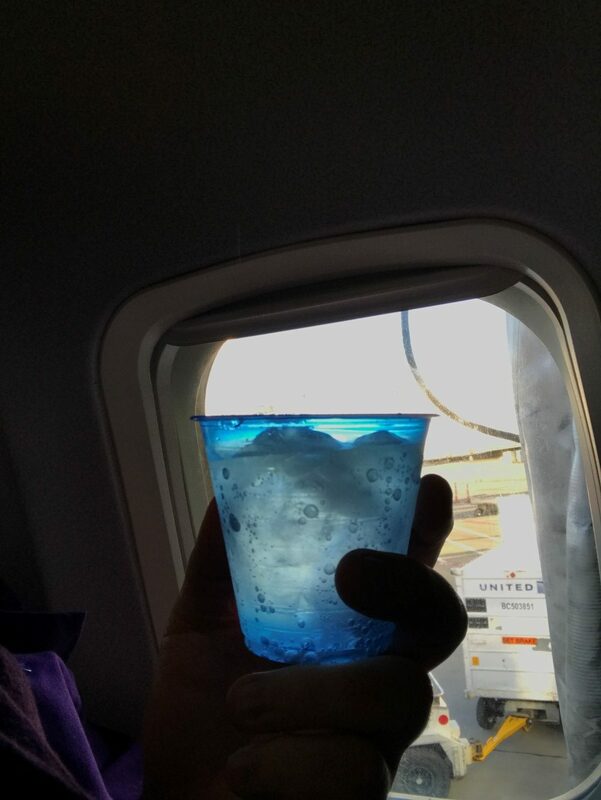 A slightly larger glass would fix the issue — and, please, glass; if passengers are paying for first class then either the fun level has to increase to “football stadium tailgate party” or the soft product standards needs to be raised higher than a Solo cup. It seems ridiculous that the US carriers don’t serve anything more than a small basket of miserable shelf-stable snacks on a flight this long. An off-brand Slim Jim and a mini-bag of popcorn do not a reasonable meal make. 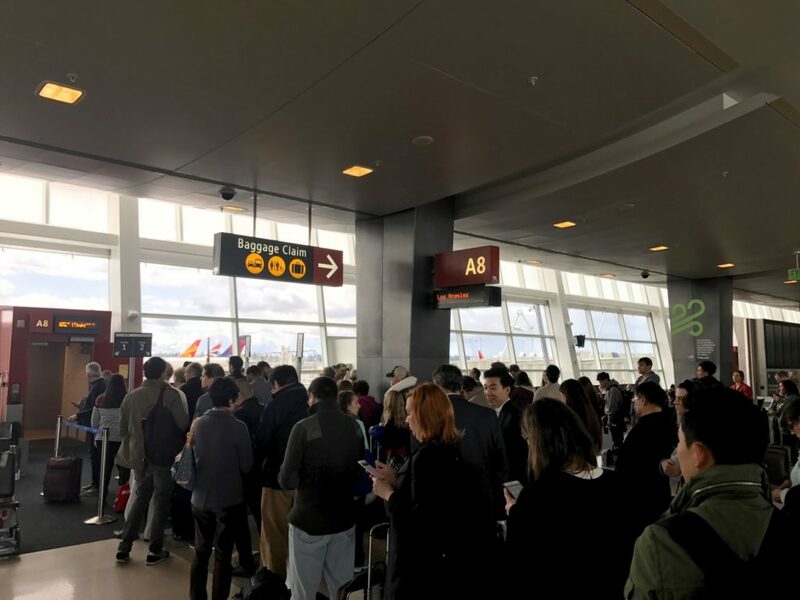 Every other region’s full-service carriers offer more options than the snack basket, even on flights operated by regional subsidiaries or contract airlines. It’s time United and the others upped their game. There’s no decent reason why United couldn’t serve a single-tray salad, hearty sandwich, or antipasto plate in ninety minutes. 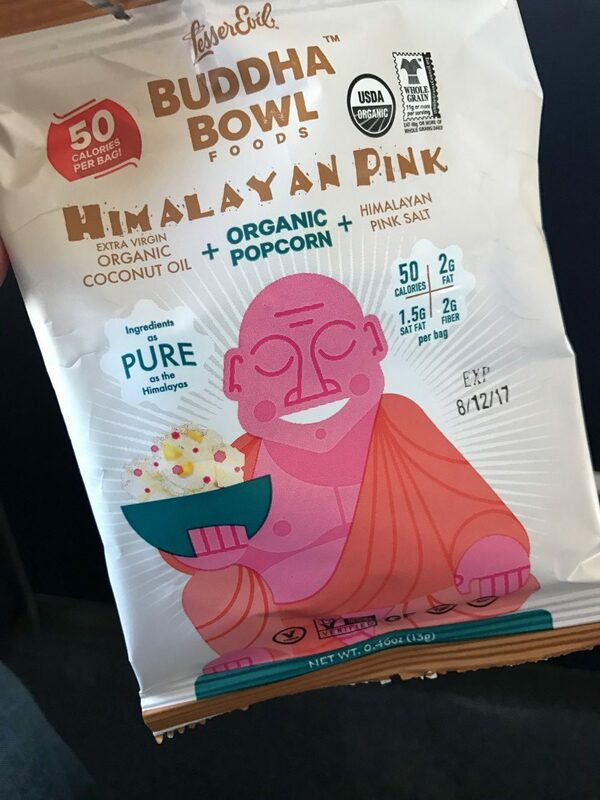 Indeed, the flight attendant on one leg had more than enough time to gossip with the non-uniformed jumpseating passenger, who also managed to hoover up a goodly part of the snack basket (which, perhaps as a result, didn’t make a second appearance in the cabin). 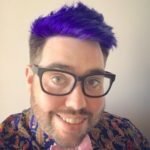 As the US airline industry continues to aim to turn “upgrade class” into a paid product, it needs to realise that it doesn’t set standards and expectations alone. Both the intra-European Swiss flights I took as part of the same longhaul ticket, as well as recent intra-Australia and intra-Asia flights of similar length, were markedly better in all three categories. 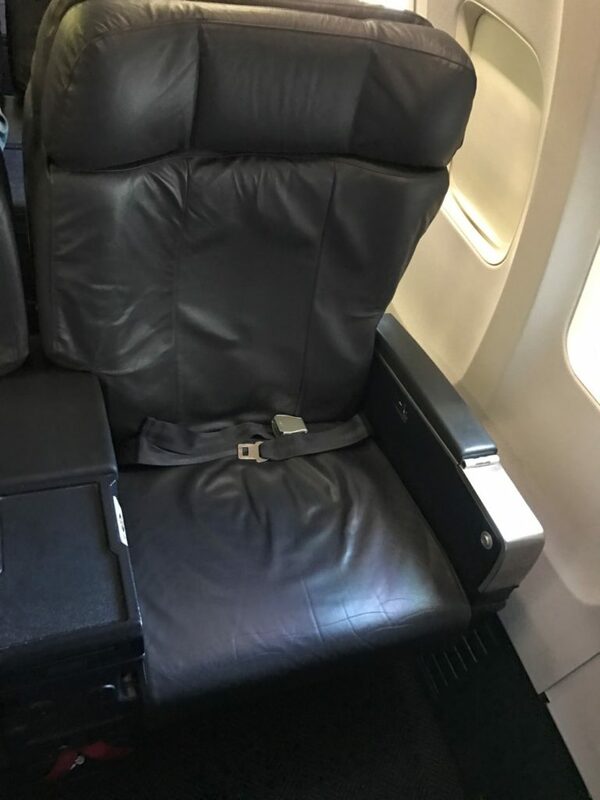 Not, of course, the seat — Eurobusiness is still not as comfortable as a larger domestic first recliner — but I think I’d choose the better service on a flight about this long overall. 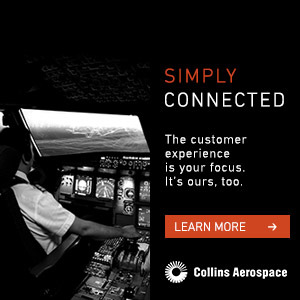 Perhaps United and the other US carriers should look to its worldwide overseas partners for inspiration. For what it’s worth, I think the main challenge with serving pre-departure beverages in plastic cups is a lack of galley space to hold another rack of glasses (or indeed 2 racks, since many domestic flights are roundtrip catered from the hub these days). You point out that the European carriers offer a better service once aloft, but at the same time, I don’t think any of them offer a pre-departure beverage service in shorthaul business class? So there’s not a clear standard for this product elsewhere. And if offering shorthaul pre-departure beverages in glass requires an entire additional galley cart (I don’t know that it does, but it might), is it really worth the floor space and weight? United offering pre-departure beverage service in Polaris in plastic, by contrast, is overly cheap — Delta does offer Delta One pre-departure beverages in glass; not sure what AA does.